The top-of-mind question with homebuyers and sellers in Northwest Vermont is whether the market’s recent healthy trends will continue. 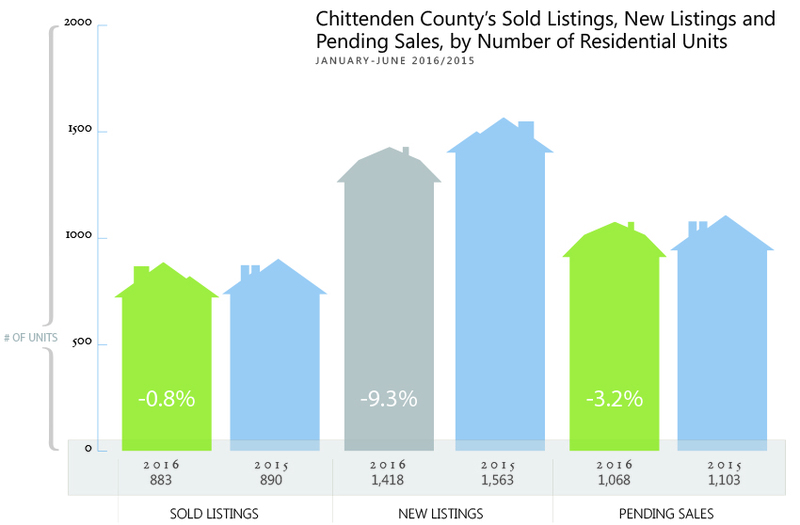 The answer, based on pricing and demand in the first half of 2016, is a definite “yes,” although tight inventory levels remain an issue in Chittenden County. Demand was robust in the first six months of the year, with the number of residential sales rising 5.1% across our region’s four counties. Pricing rose slightly, with a 0.5% gain, although the area’s busiest region – Chittenden County – witnessed a 4.7% gain in median sale pricing. Economic trends continue to strengthen in Northwest Vermont, with local businesses and institutions such as MyWebGrocer and University of Vermont continuing to hire. With new professionals moving to the region, they are spurring demand for both residential properties and rental apartments. The unemployment rate in Vermont stood at 3.1% in May, among the lowest in the country. Still, several economic concerns at the national and international level may be making consumers feel less confident, at least for the moment. Consumers remain “cautiously optimistic” about economic growth, according to the Conference Board’s June survey. The pending presidential election may cause some consumers to hesitate to commit to big purchases until after the vote. Additionally, the U.K. has voted to leave the European Union, which has added to concerns about the strength of the international economy. The uncertainty has prompted the Federal Reserve to hold off on raising interest rates. The good news for the property market is that mortgage rates remain at near-record lows, which means lower borrowing costs for buyers or homeowners who want to refinance. 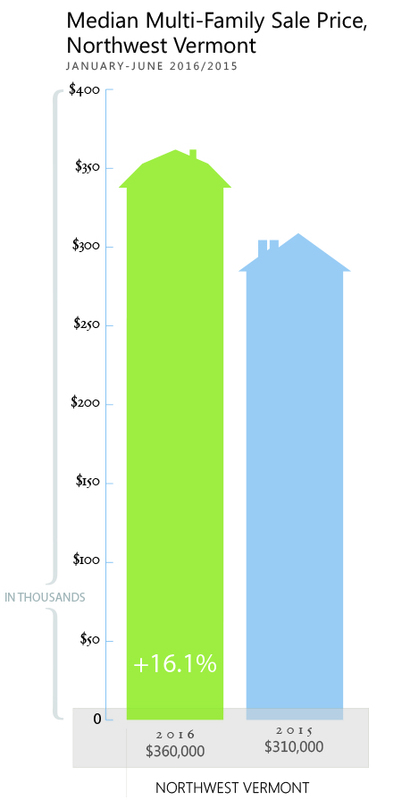 Yet even with those low rates, affordability remains problematic, most notably in Chittenden County. Some buyers are seeking housing in lower-cost counties such as Franklin and Addison Counties. Within Chittenden County, the most sought-after housing is in the $250,000 to $400,000 range, although the market is suffering from low inventory in that segment. Because of those trends, first-time home buyers, especially those in the millennial generation, may either remain renters or make sacrifices to purchase their first homes, such as looking farther afield for property or buying a home that needs renovation. First-time homebuyers are returning to the market, however, with a Coldwell Banker Hickok & Boardman Realty survey last year finding that 37% of our clients had just purchased their first home, close to the typical 40% of the market. Some builders are responding by adding affordable housing units, while earlier this year a new coalition called Building Homes Together was formed with the goal of adding 3,500 new homes over the next five years. Act 46, the education governance reform law passed last year that calls for larger school districts, continues to evolve, with school districts and communities around the state evaluating school mergers. Because of these changes, we recommend homeowners and potential buyers discuss the possible impact with their Realtor, local lawmakers and school board members. Regardless of inventory levels, our Realtors are finding that well-priced homes in good condition are enjoying strong demand from buyers. Before listing, sellers should consider upgrades and fixing deferred maintenance issues, since buyers may be less likely to bid on a home that needs work. “Smart-home” technology, for temperature control, lighting, and security, may also help your home stand out, especially with tech-savvy buyers. Coldwell Banker Hickok & Boardman Reality is forecasting continued steady growth in pricing and sales for 2016. Based on current trends, we believe sales volume may rise about 5 percent, while pricing could gain about 1% to 2%, or similar to the national forecast from the National Association of Realtors. After a slow start to 2016, the luxury market picked up as warmer weather arrived. 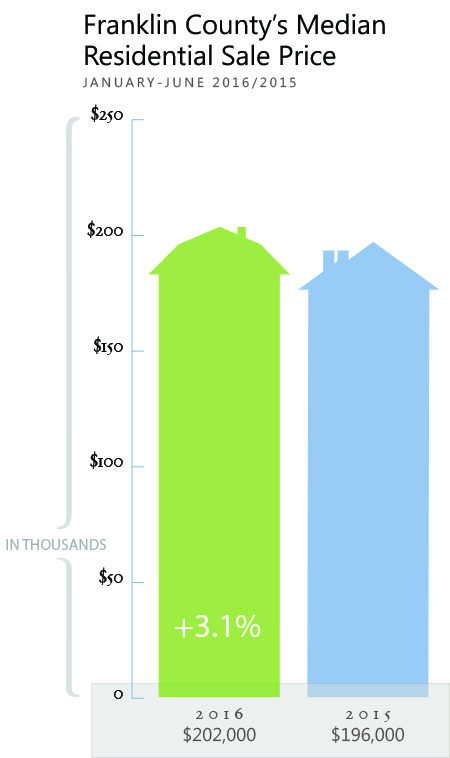 During the first half of the year, the region recorded 18 sales of properties priced above $800,000. Unlike the mid-priced segment for homes below $400,000, the luxury market continues to have deep inventory. As a result, the luxury segment remains tilted in favor of buyers, with some homes requiring years of marketing before the right buyer becomes interested. Some sellers have lowered their price expectations as a result of these dynamics. The Northwest Vermont real estate market currently provides an excellent variety of choices for high-end buyers, given the number of luxury lakefront estates and mountain homes that are now available. 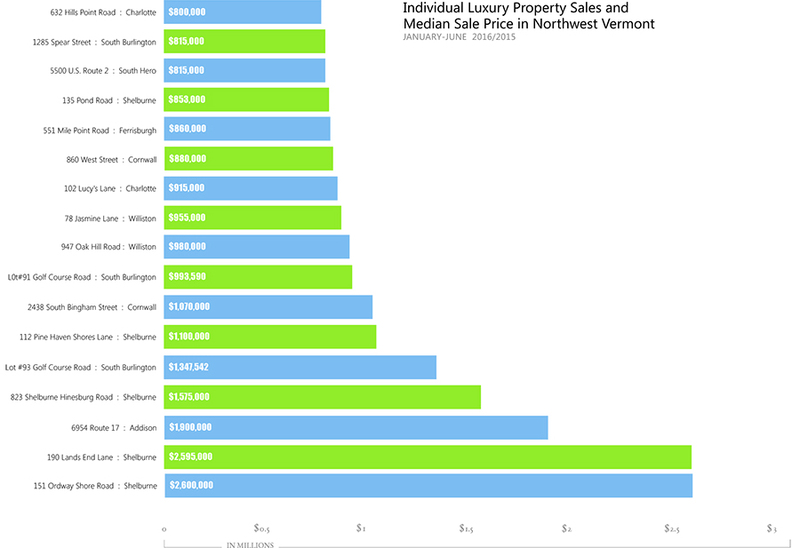 While Shelburne remains a popular location for luxury buyers, we have seen few sales over $800,000 in many surrounding towns including Burlington, Charlotte, Williston, and South Burlington. Because of the high inventory levels for homes priced above $800,000 and the time required to sell them, some buyers remain hesitant to commit to a purchase. Executives who are relocating to Vermont and may only remain in the state for a few years may be especially concerned about these trends. Buyers returned to waterfront properties this year. Almost half of the sales so far have included access to Lake Champlain. The three highest-priced sales represented homes situated on the lake. As buyers continue to search for property this summer and fall, sellers should prepare their homes to be competitive in the luxury market. Competitive pricing and addressing deferred maintenance, landscaping issues, and decluttering remain essential. 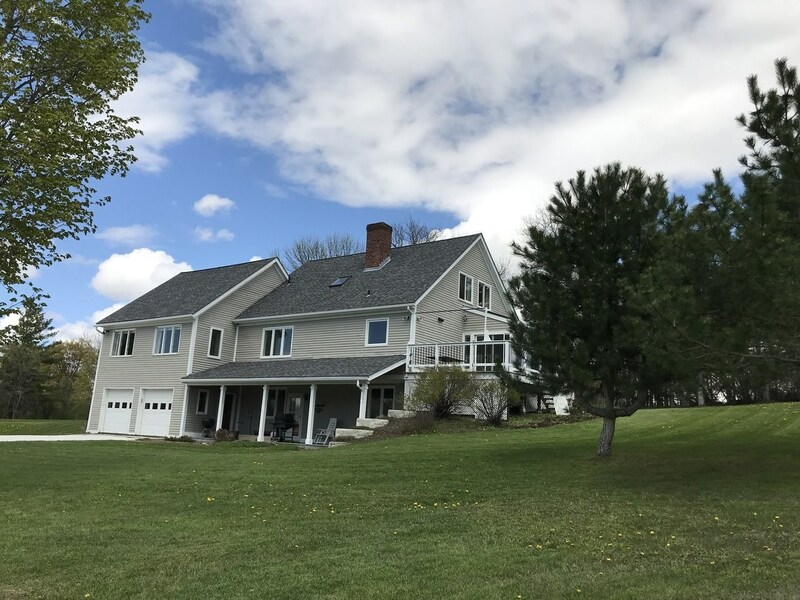 Addison County is showing an increased demand and an influx of new buyers, some of whom have expanded their property searches within the county because of tight inventory levels in neighboring Chittenden County. As a result, demand remains robust in the first half of 2016, with the number of residential transactions rising 8.2%. 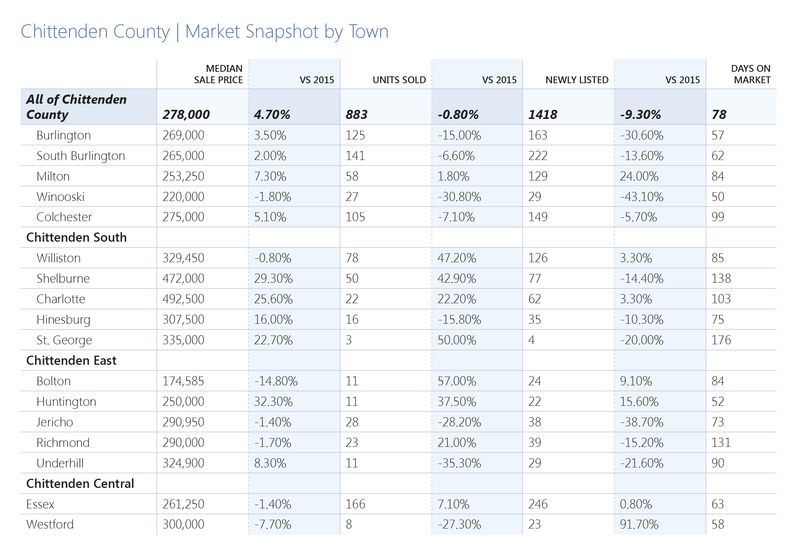 Of the four counties tracked by this report, Addison County reported the smallest increase in median sale price, with a rise of 0.7%, indicating that some buyers are opting for lower-priced inventory. The boost in activity has helped to absorb excess inventory in Addison County, which currently has about 10 months of available inventory compared with a recent high of more than 15 months in February. With gas prices remaining below $2.50 a gallon, the county is more affordable for professionals who commute within the county or into Chittenden County than before 2014, when prices at the pump were more than $3 a gallon. Ferrisburgh witnessed an 82 percent jump in residential sales, although buyers sought out slightly lower-priced inventory, with the median sale price slipping 7.3% to $255,000. With 20 sales so far this year, Ferrisburgh is the county’s second-busiest market after Middlebury. Middlebury remains the largest market for real estate transactions, although the number of transactions slipped 20.7% to 23 sales in the first six months. Pricing was relatively steady, with a small decline of 2.7%, which may indicate that buyers are seeking out affordable properties. Middlebury College and other local employers such as Otter Creek Brewing are adding staff, helping to bring more buyers into the Addison County market. The unemployment rate in the county stands at 3.5%. The luxury market is typically a draw for buyers seeking waterfront properties or mountain estates. The county recorded four luxury sales of more than $800,000 in the first six months of the year, out of the region’s 18 sales of homes in the over-$800,000 range. That puts Addison County on track to match the 2015’s luxury market, when buyers bought seven properties above $800,000 within the county. The rental market in Northwest Vermont remains tight, although there’s some good news on the horizon for renters: with an influx of newly constructed apartments, rental prices are showing signs of stabilizing, a trend that is expected to continue. The vacancy rate stood at 2.1% in June, significantly higher than the rates seen in 2010-2014, when it averaged about 1.4%, according to real estate consulting firm Allen & Brooks. With more than 3,000 new apartments being constructed across Chittenden County, there will be more options for renters, including some new affordable housing and age-restricted rentals. Almost 600 new apartments will open in 2016 alone, Allen & Brooks forecasts. The burst of new construction is providing more choices to renters, such as whether to opt for a newly constructed apartment or an older home in neighborhoods such as Burlington’s Old North End, according to our Agents. Newer buildings may be slightly more expensive, but also can include some amenities, such as covered parking, that older properties do not. Monthly rents are stabilizing, thanks to the slightly higher vacancy rates and newly constructed apartment buildings. The rate of increases should moderate in the near future, after several years of rates increasing at more than 2 percent annually, Allen & Brooks notes. Renters should plan to begin their search for a new apartment about 45 days to 60 days before they move, according to our Agents. Finding a rental can be competitive, even with the higher vacancy rate. 237 Pearl Street Apartments in the Old North End and Riverrun in Winooski. The county’s vacancy rate is 2.1%, significantly below the national average of 4.5%. Rents have increased by more than 2% annually since 2011. The multi-family property market in Northwest Vermont continued to show robust trends in the first half of 2016, thanks to the region’s low vacancy rate and growing professional population. The multi-family market is continuing to draw out-of-state, international, and local investors because of these trends, according to our Agents. Across the four counties, 63 multi-family properties changed hands during the first six months of the year, an increase of 21.1%. The median sales price rose 16.1% percent to $360,000. As with the residential market, tight inventory remains an issue for the market, with demand exceeding supply. Because of these dynamics, well-priced, well-located properties are selling quickly. Inventory remains especially tight in Burlington and Winooski, with the latter experiencing a surge in interest from renters because of its revitalized downtown area, which has brought new restaurants and shops to the former mill town. 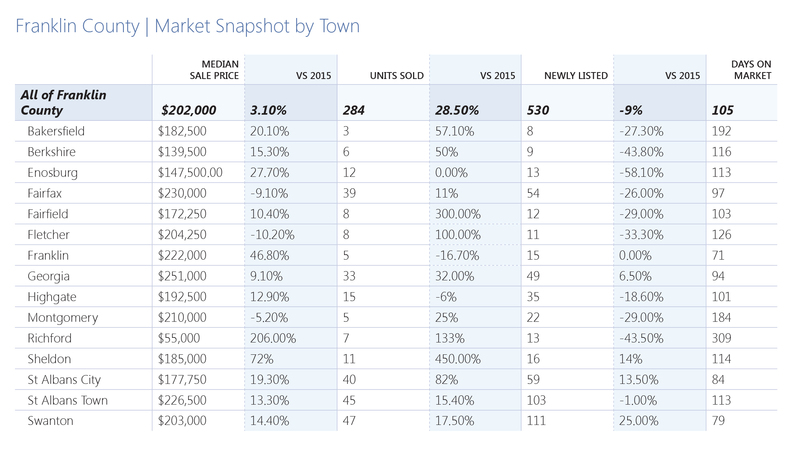 A lack of inventory continues to be an issue in both Winooski and Burlington. 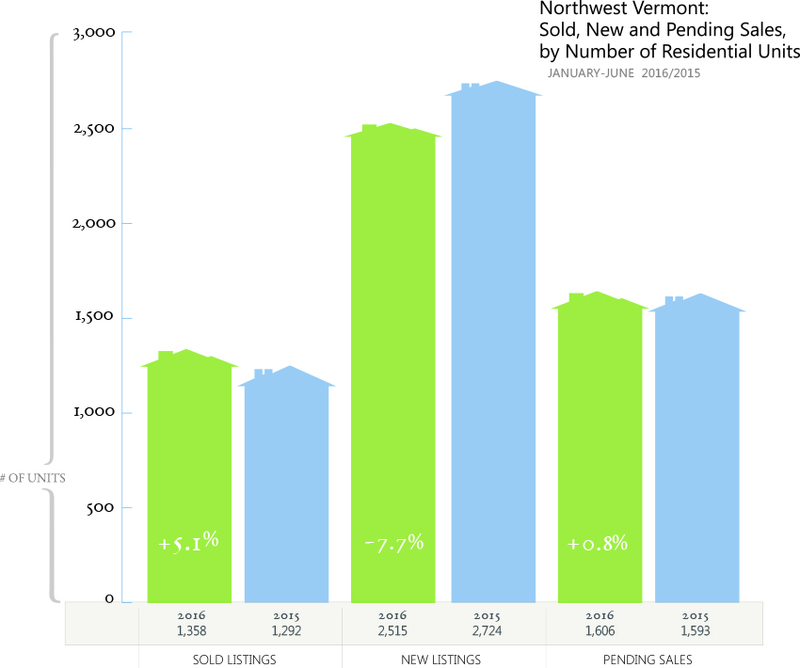 The number of newly listed properties slipped 36% in Winooski and more than 10% in Burlington. The rental market’s vacancy rate stood at 2.1% in Chittenden County in June, according to real estate consultancy Allen & Brooks. That’s significantly higher than the rates seen in 2010-2014, when it averaged about 1.4%. While rents are stabilizing as a result, that hasn’t impacted demand or pricing for multi-family properties as the region’s vacancy rates are substantially lower than the roughly 4.5% national rate. Builders are responding to demand, with more than 600 new apartment units slated to be built this year, according to Allen & Brooks. Although newly constructed units tend to have higher rents than properties in existing properties, the added inventory may stabilize rents across the region. Demand for rental housing is likely to remain strong, partly because median household incomes still haven’t caught up with their 2008 peak. 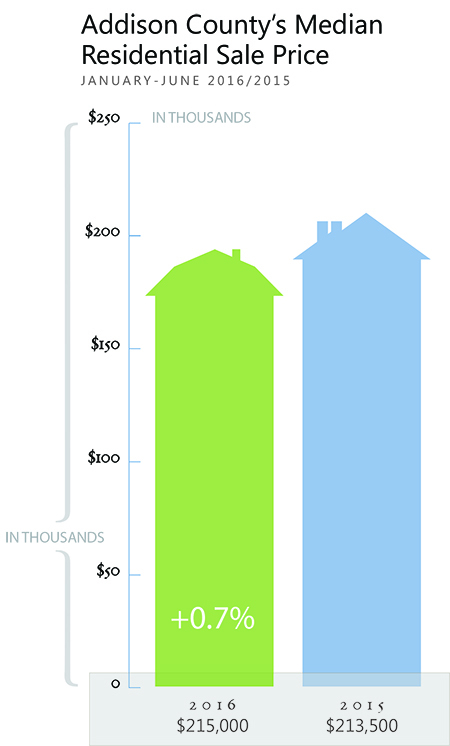 At the same time, single-family homes have appreciated in value, making them more expensive for first-time homebuyers. Younger buyers with student loans may end up in the rental market for more years than older generations because of their loan repayments. Allen & Brooks is also forecasting increasing demand from seniors for rental housing, as many decide to scale down and sell their single-family homes. After a strong 2015, Chittenden County is experiencing another healthy year, although with some headwinds thanks to tight inventory levels. With fewer homeowners listing their properties for sale, buyers are increasingly bidding up properties, especially in the “sweet spot” of homes priced between $250,000 to $400,000. Inventory between $250,000 and $400,00 is particularly tight, however, prompting some buyers to search deeper into the available inventory for homes that may need some work. In some cases, buyers are opting to expand their searches into neighboring counties with more affordable housing stock. Buyers are enjoying one bright point, however: the cost of borrowing is extremely low, thanks to continued downward pressure on mortgage rates. Essex and South Burlington were the most active towns during the first half of the year, with 166 and 141 transactions, respectively. Burlington, the third-most active town with 125 sales, has suffered from extremely tight inventory levels. New listings in Burlington have dropped by about one-third during the first six months of the year, pushing some buyers to search a wider geographic area. The median sale price in Burlington gained 3.5% during the first six months of 2016. Because of high demand for Burlington properties, some homeowners are opting to sell their properties through private transactions. Young professionals are increasingly interested in making their first home purchase, thanks to low mortgage rates that can make monthly payments lower than renting a comparable home. The most in-demand properties are in the sweet spot of $250,000 to $400,000, although inventory remains extremely tight in that range. While buyers are also interested in homes with a slightly higher price point, there is more availability with inventory priced above $500,000. Towns such as Shelburne and Charlotte, where the median sales price is almost $500,000, are witnessing strong demand so far this year. Given tight inventory in Burlington, some buyers are pushing their searches into towns including Williston and Richmond, which also saw an uptick in demand this year. Large employers such as University of Vermont and tech companies such as MyWebGrocer are hiring, helping bring new homebuyers into the market. The multi-family market recorded 51 sales in the first half of 2016, an increase of 27.5% compared with a year earlier. For a longer discussion of trends in this market, please see our multi-family section in the Mid-Year Market Report. Demand rose for land sales, with 26 sales in the first half of the year, an increase of 30%. The median sale price slipped 2.5% to $148,750, which may reflect buyers seeking slightly lower-priced property. As in other counties, professionals and retirees are seeking land where they can custom-build new homes. Buyers are turning to Franklin County to search for residential properties in the sub-$250,000 range, especially as inventory has tightened considerably in neighboring Chittenden County. Gas prices remain stable and below $2.50 a gallon, which makes the county a more affordable option for professionals who commute to Chittenden County or other locations. The first six months of 2016 continued to demonstrate the historical split in pricing and demand for the eastern and western sides of the county. Towns on the western side are witnessing stronger demand and pricing, partly because they are closer to 1-89 and more attractive to commuters. Eastern towns such as Richford tend to record lower median sale prices. Because of Chittenden County’s tight market, some buyers are looking deeper into the available housing stock within Franklin County, helping to absorb some of the county’s excess inventory. The market currently carries about 7 months of available inventory, or about half the levels seen in January. Because of those trends, prices are rising, with some buyers considering homes that may have been on the market for a while or are in need of upgrades. 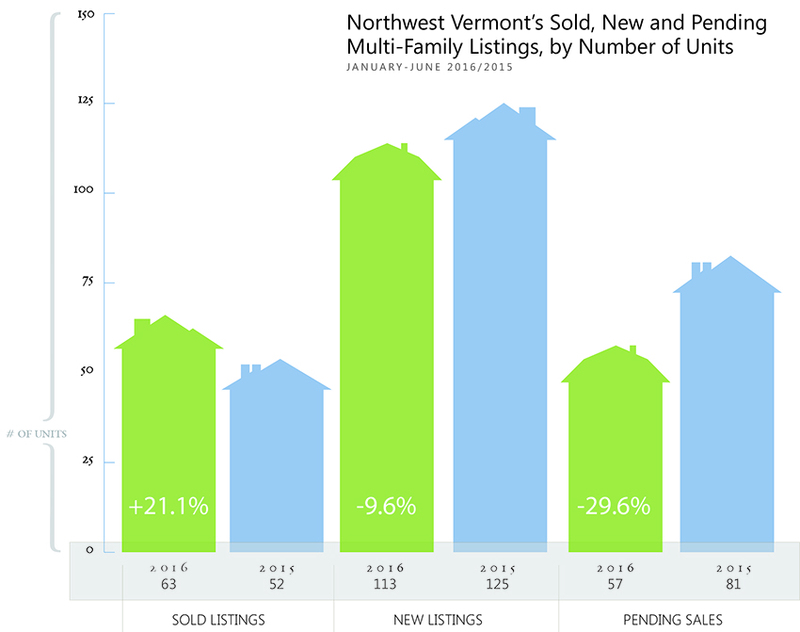 With tighter inventory in both Franklin and Chittenden counties, buyers are pushing up prices. The median sale price in Franklin County rose 3.1% to $202,000, marking a rare instance of the county’s median sale price tipping above the $200,000 mark. 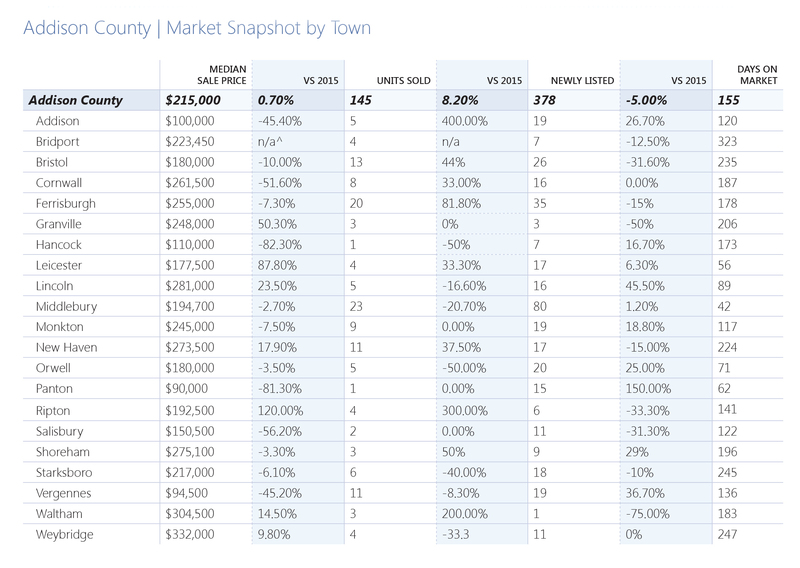 Even with the higher median sale price, Franklin County remains the most affordable county within Northwest Vermont. Buyers who are priced out of Chittenden County, where it can be difficult to find homes in the sub-$250,000 range, often turn to Franklin as an affordable option. Companies such as Superior Technical Ceramics, which makes specialty ceramics for industrial use, and pharmaceutical firm Mylan Technologies are hiring, helping push the unemployment rate down to 3.5%. Land sales doubled during the first half of the year, rising to 22 transactions from 11 a year earlier. The median sale price rose more than 22 percent to $75,500. With the stronger economy and tight inventory levels, some professionals and retirees are opting to buy land parcels and custom-build homes. The multi-family market was little changed, with 10 sales in the first half the year, compared with 11 a year earlier. The median sale price slipped 25% to $206,625. Grand Isle’s property market tends to focus on two segments: the high-end luxury market and the mid-priced tier. For the first six months of 2016, sales were focused on the latter segment, with the median sale price rising 5.4% to $221,250. That places Grand Isle’s property market in the middle of the price range for Northwest Vermont, offering more value than in neighboring Chittenden County but slightly more expensive than homes in either Franklin or Addison counties. The number of transactions fell slightly, slipping 2.1% to 46 sales. 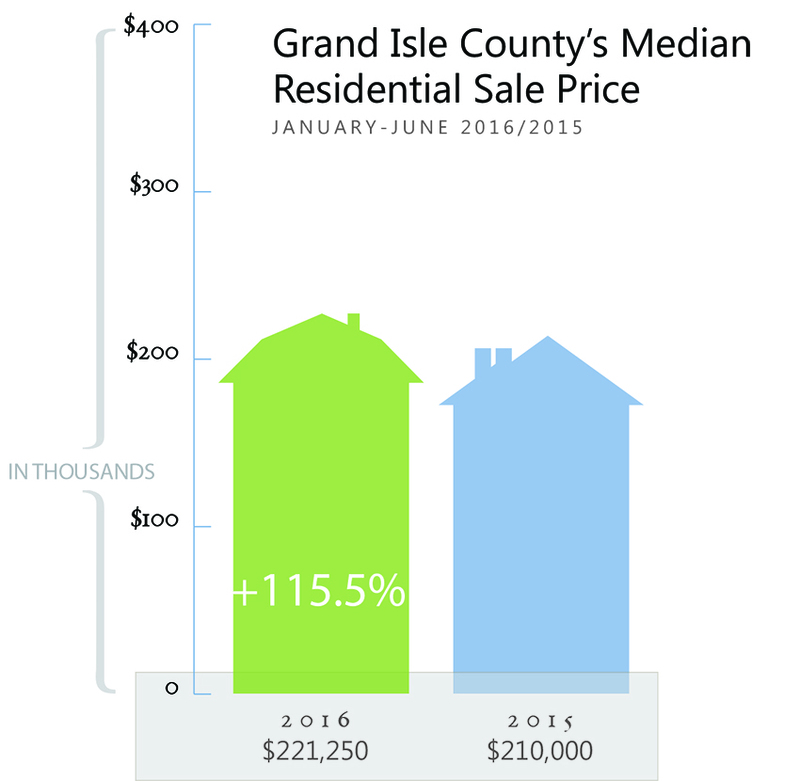 Because Grand Isle is the smallest real estate market in Northwest Vermont, just one or two transactions may have a large impact on the county’s pricing and demand trends. There are currently 17 months of available inventory in Grand Isle, more than in neighboring counties – yet down from more than 38 months of unsold inventory in April. The most in-demand towns are located in the southern part of the county, since their proximity to 1-89 are attractive to buyers who work in neighboring counties. For the first six months of 2016, the most active market has been the town of Grand Isle, with 18 sales. Grand Isle’s luxury market tends to pick up during the summer months. So far this year, the county has recorded one luxury sale, an $815,000 waterfront property with views of the islands and Green Mountains. A few sales can have a big impact on median sale prices or volume because the property market is relatively small. Twelve land sales were recorded in the first half of the year, or four times the three land sales completed a year earlier. The median sale price rose 22% to $73,333. Some buyers are opting to purchase lots and construct custom-built homes, rather than searching for pre-existing inventory. Lovely house on 11 beautiful acres w/fields, barn & outbuildings. Maintained to high standards! Terrific lifestyle opportunity!